Cooking is a process to make food ready to eat by heating it. Cooking can kill bacteria that may be in the food. Raw food is food that is not cooked. Some foods are good to eat raw. Other foods are not good for the body when they are raw, so they must be cooked. Some foods are good to eat either raw or cooking. 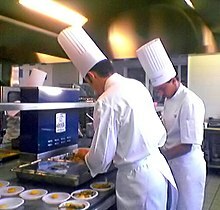 Cooking is often done in a kitchen using a stove or an oven. It can also be done over a fire (for example, over a campfire or on a barbecue). The heat for cooking can be made in different ways. It can be from an open fire that burns wood or charcoal. It can be on a stove or in an oven that uses propane, natural gas, or electricity. There are several different ways to cook food. Boiling cooks food in hot water. Frying (deep or shallow) cooks food in hot butter, fat or oil. Baking and roasting cook food by surrounding it with hot air. Grilling means cooking food on a metal grill that has heat under it. People often cook meat by boiling, roasting, frying, or grilling it. Some foods such as bread or pastries are usually baked. Usually food is cooked in some kind of pot or pan. Sometimes people cook food by putting it directly into the fire, or by wrapping the food in leaves before they put it into the fire. A person whose job it is to cook food may be called a cook or a chef. The word cooker means a machine or tool that a cook might use to cook food. Rice cookers and pressure cookers are examples. Wikimedia Commons has media related to Cooking. This page was last changed on 21 March 2019, at 06:37.